Astigmatism is a common refractive error that stems from problems with the shape of the cornea, the transparent layer forming the front of the eye. According to a US study, almost three out of every 10 children between the ages of five and 17 have astigmatism. It may also develop in the course of life, causing blurred vision. While it does not result in blindness, it can create certain problems and may require treatment. Come and see us at The New Jersey Eye Center in Bergenfield NJ if you suspect you might have astigmatism. Astigmatism is not a disease but an imperfection in the eye resulting in blurred vision owing to the way the eye focuses on light. No matter what kind of astigmatism you are afflicted with, rays of light form two focal points instead one, thus affecting vision. The three main types of astigmatism are myopic, hyperopic, and mixed astigmatism. The type of astigmatism one has depends on whether the principle meridians of the eye are nearsighted or farsighted. The meridians are like the lines connecting 12 and six or three and nine on a clock face. The principal meridians are the steepest and flattest meridians of an eye with astigmatism. Myopic astigmatism means that one or both eyes’ principal meridians are nearsighted. So, the extent to which they are nearsighted differs. With hyperopic astigmatism one or both of the principal meridians are farsighted to a varying degree. Mixed astigmatism means that one of the main meridians is nearsighted and the other farsighted. The cause of astigmatism is unknown. If a person is born with it, it may be hereditary. An eye injury or eye surgery may cause it to develop. When the cornea has an irregular shape like an American football rather than a symmetrically round one, this may give rise to astigmatism. Sometimes, astigmatism can be caused by abnormalities in the shape of the eye’s lens. This is called lenticular astigmatism, as opposed to corneal astigmatism, which is the more common type. 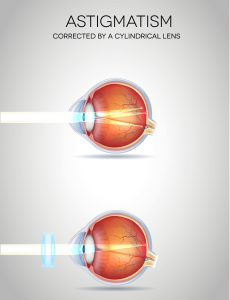 Astigmatism tends to cause blurred or distorted distance vision to a certain extent. Astigmatism may be asymptomatic, but advanced degrees of it can cause symptoms such as blurry vision, double vision, squinting, fatigue, or eyestrain and headaches, especially after reading. refractive surgery – there are several types of refractive surgeries; but they all permanently change the shape of the cornea. The correction option that your eye care specialist chooses for you will depend on your eye health, refractive status and your lifestyle. If you think you might have astigmatism, we recommend that you have your eyes examined by one of our specialists. An eye examination will determine whether you have it, the extent of it and its axis. Feel free to contact us or simply walk into get your eyes checked for astigmatism. Will my astigmatism get worse? It is highly dependent on the individual. Because of this, there is no set answer to this question. There is a possibility that your astigmatism will change as you age and, unfortunately, this is generally a change for the worse. For many people with the condition, this is likely. However, because an astigmatism isn’t a disease, any changes for the worse can be remedied with optical lenses. These could be either contact lenses or glasses. For some people, refractive surgery may be an option. Can I pass my astigmatism on to my children? At this point in time, it is unknown if astigmatism is a hereditary condition. 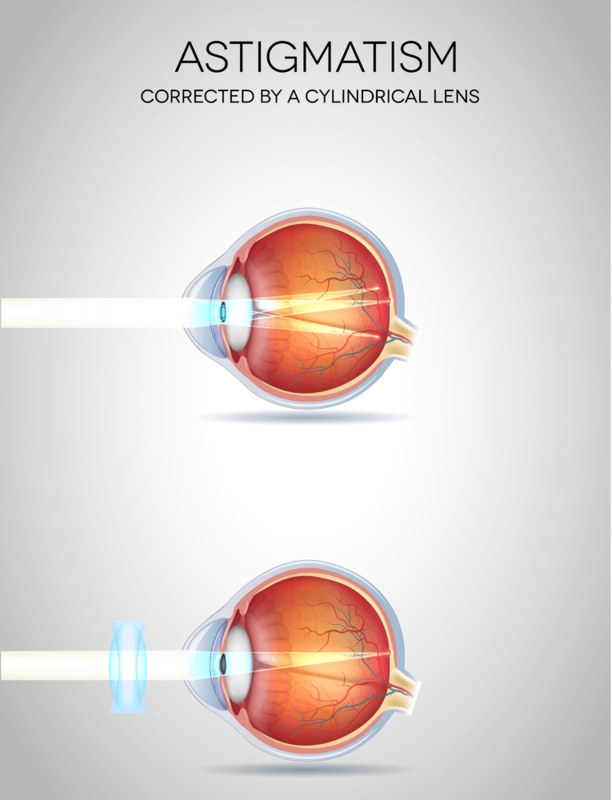 In fact, we still don’t know exactly what causes the refractive error. Because babies have been born with astigmatism, some researchers do believe that there is a hereditary component. But astigmatisms can also be the result of an external factor like an injury. Does astigmatism lead to lazy eye? There is a link between amblyopia (“lazy eye”) and astigmatism. If the astigmatism is on the more severe end of the scale, and it is left untreated, then amblyopia may develop. To make sure this doesn’t happen, simply wear your prescribed glasses or lenses. Vision exercises may also be prescribed. Are glasses or contact lenses better? It’s really up to the individual with astigmatism which they prefer. Contrary to popular belief, contact lenses can also be worn to correct the refractive error. Toric contacts are regularly prescribed. It occurs when the unequal curve on the cornea (or possibly the lens inside) means that one of the eye’s meridians is far-sighted, and the second meridian is nearsighted. Mixed astigmatism can also be corrected with glasses and contact lenses. Laser eye surgery may also be an option. But the results are not always as predictable than they are with a non-mixed astigmatism. Will my astigmatism go away? Unfortunately, no. If you have it, you’ll have it for life. The good news though is that many people have this common condition and it can be simply corrected with glasses and contact lenses. How will it affect my vision? Most people with this eye condition report blurred vision as the main symptom. This happens when the eye and its functional elements can’t focus sharply. Other people with astigmatism may experience fluctuations in the sharpness of their vision, particularly after spending a lengthy period of time reading or in front of a computer screen. Another, more uncommonly reported, symptom of astigmatism is an increased difficulty seeing in low light or in the dark. It’s useful to remember that as long as you wear your prescribed glasses or contact lenses, these symptoms will not be an issue for you. We hope these FAQs have been helpful. If you require more information or have specific questions, please make an appointment to come in and see us. Our highly qualified and professional eye specialists are experts at astigmatism correction. Short Description: Astigmatism is a common refractive error that stems from problems with the shape of the cornea, the transparent layer forming the front of the eye. According to a US study, almost three out of every 10 children between the ages of five and 17 have astigmatism. It may also develop in the course of life, causing blurred vision. While it does not result in blindness, it can create certain problems and may require treatment. Come and see us at The New Jersey Eye Center in Bergenfield NJ if you suspect you might have astigmatism.